Christianity | Why Dont You Blog? For years now, some town halls have been renaming their Christmas Lights as Winter Lights festivals. More and more Christians are ending up in court, defending themselves against what they see as victimisation for not being allowed to wear a cross to work or to pray for a patient. Ah ha, the programme has actually found a council that called its Christmas decorations “Winter Lights” one year (not “some town halls” and not “for years” then.) The council has now again rebranded the light switching-on procedure, as “Christmas in Autumn” or something. Wny is the name given to street lights even remotely newsworthy? Because of the media that feels no shame in trying to stir up controversy about nothing, maybe. This was a truly annoying programme. It gave yet more credibility to the extreme wing of Christians, accepting their self-definition, so confusing the boundaries between them and the mainstream churches. Although no member of the mainstream churches seems to have got into any dispute over wearing crosses, etc., any act of overzealous-personnel-management-madness directed against these people now gets seen as representing an attack on Christianity as a whole. Who would have thought Christian Voice would have cracked under the pressure of the No God bus campaigns in London? OK, most people I suppose. Still it is entertaining that they are riled by a simple poster to the extent they are demanding the UK’s Advertising Standards Agency to rule on the proof of God. An atheist campaign claiming “There’s probably no God” has been reported to the advertising regulator. Posters with the slogan appear on 800 buses in England, Scotland and Wales, as well as on the London Underground. But organisation Christian Voice has complained to the Advertising Standards Authority saying they break rules on substantiation and truthfulness. Pardon me for a moment while I fall off the chair laughing. But Stephen Green, national director of Christian Voice, said: “There is plenty of evidence for God, from people’s personal experience, to the complexity, interdependence, beauty and design of the natural world. More laughter rings out around WhyDontYou Towers. Evidence for God exists in “personal experience” – surely this alone is a self defeating argument because if I do not have that experience the advertisement is accurate as stated. I do not have that personal experience, therefore (should the ASA be reading this) the banner is 100% correct. Thank you Christian Voice. I assume Christian Voice have lodged similar complaints over any advertising that mentions non-Christian religions, so any posters for Mosques, Temples (etc) will have to come down. I would never suggest people be petty enough to go through Christian advertising with a fine tooth comb – each day on the way to work I see a huge poster telling me that I will die for my sins, where is the proof of that I wonder? A London church commissioned a market research survey which found that most people don’t believe in the nativity story. 70% of those questioned didn’t believe it, including a quarter of the Christians who replied. A fifth of Christians also didn’t believe that Jesus was both God and man. Without being wholly convinced of the validity of this research, I am cheered by the thought that most English people – atheists and Christians alike – seem to be still sanely sceptical. St Helen’s Church in Bishopsgate, London, which commissioned the survey, has produced a film of “sound evidence” supporting the Bible’s account. I like this line of argument. If I say that green cows are somersaulting down the street, does the story gain any reflected credibility if I also mention that Barrack Obama recently became President-elect? So saying that events that supposedly took place around the year 0 AD took place at the same time as other events around the year 0 AD can’t possibly provide support for whether the doubtful ones are true. Most modern biographers of Herod do not regard the massacre as an actual historical event. Many scholars portray this and other nativity stories as creative hagiography rather than history. The Catholic Encyclopedia in 1910 suggested that these numbers were probably inflated, and that for a town of that size probably only between six and twenty children would be killed, with a dozen or so more in the surrounding areas. In fact, with reference to the gospel of Matthew, the word “identity theft” springs to mind. If the BMRB survey is to be believed, almost 3/4 of British people accept this academic evidence and doubt the supposedly “sound evidence” offered by St Helen’s Church, Bishopgsate. How encouraging is that? Spot the difference between a relatively-godless religion and a god-heavy one. Gurkha chefs won a silver medal in some military cooking competition with a lard Buddha. Well, not really much of a news item, but 100 hours of solid and “boring” lard-sculpting must count for something. At least some Gurkha Buddhists can obviously mix comedy, creativity and philosophy in a way that could shame the monotheists. A New York art gallery has decided to cancel an exhibit of a chocolate sculpture of Jesus Christ after protests by a US Catholic group…..
We’re delighted with the outcome,” said Kiera McCaffrey, spokeswoman for the League. Ms McCaffrey had called the exhibit “an assault on Christians”. That one actually made it to the Congressional record. I started counting the rant words (“outrage”, “shock”, “indignity”, and so on) but got distracted by the idea that it was obviously some game of outrage bingo. With congressmen trying to outdo each other in their plundering of an imaginary Rhetorical Rage Dictionary. So congratulations, Gurkha chefs, for your charming lardtastic efforts. Sadly, this was posted because some one commenting on the Daily Telegraph thought that an appeal to Pascals Wager was a logical argument. Let’s see, if I choose not to be a Christian and there is no God, I die and nothing happens. If there is a God, I die and go to Hell. If I choose to be a Christian and there is no God, I die and nothing happens. If there is a God, I die and have eternal life. I mean, what century are we in? Are there really people who think this is a legitimate “rational” argument, much less a legitimate reason to have faith? Surely if the great Abrahamic Sky Pixie is so insanely jealous all must bow before him, he is going to get pretty annoyed at this line of reasoning…. 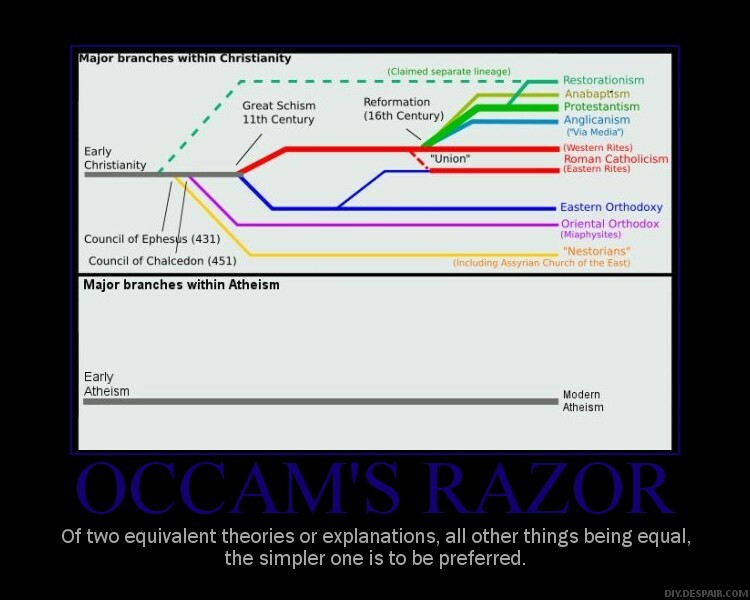 Still, who ever said Christians were logical? Anyway, today I got one which bucked the trend slightly. It weirdly manages to hide the merest kernels of truth in a whole package of myths, but then I suppose that is the goal. I assume that who ever went to the trouble to make up these bits of nonsense are trying to stir jingoistic pride in something which never existed. Ok, while not a real quote it hints at a line taken by John Howard. Oddly this pretty much dates the message to February 2006, so we get the first hint that this is just nonsense that has been running round the internet like a ghost in the machine. Wowser. This is good. Again, I can find no evidence it was actually stated by John Howard, so I now suspect this is the opening line from the emails actual author. It is nice how this glosses over how the Australians “sought” freedom – I am sure the aboriginal tribes will have a different concept of “victories” and certainly a different idea of what freedom means. Again, this seems to be more an American worry than an Australian one. I never realised Spanish and Lebanese were significant languages down under. Even if it is genuine Australian it has two big flaws that are often overlooked by bigots. Even more crap with a side order of bad history. Australia was not founded on Christian principles. The founding of Australia is clearly documented. The real history of Australia admits no “founders” to speak of and is a fascinating bit of reading. It really is. Spoiling it with this revisionist nonsense is a shame and a lie. And we all know that not only is lying for Jesus a sin, but lies make baby Jesus cry. So Hermes only knows why the obvious Christian who wrote this nonsense felt the need to lie so much. Hmm. “We will accept your beliefs” as long as they are the same as ours is what the email is basically saying. Well, this is looking very un-Australian. “Our Flag” and “Our Pledge” scream out American to me, but I might be wrong. Now, if only we could get the aboriginal natives to apply this with precedence as being the real inhabitants of the country. If we assume for one second that this really is a true Australian view point, it becomes interesting how nations which came to be by systematically exterminating the local inhabitants are the most vocal when it comes to claiming rightful ownership of their land. Is it because they are scared others will do unto them as they did to others? Maybe if we circulate this amongst ourselves, British citizens will find the backbone to start speaking and voicing the same truths. Here we go. Does a collection of badly written lies and myths give people backbone? When the original author speaks of “British Citizens” does s/he just mean the white ones? What about the vast diversity of cultures who have CITIZENSHIP in the UK? Don’t they count any more? I don’t so I didn’t send it on. If who ever emailed this to me is reading this – “you are an idiot – learn to spot nonsense.” If you are reading this and you have forwarded this message (or any of the similar bits of crap) on, then you are also an idiot – please stop. P.S I think this also goes for us when going to other countries as well! I wonder if this PS was part of the original.